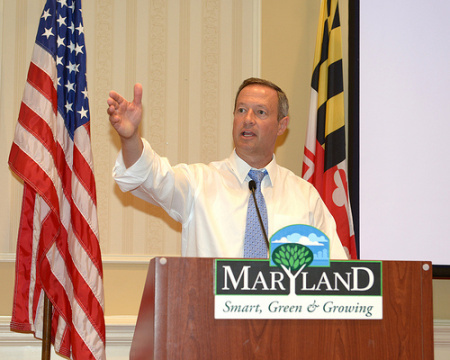 What would US climate policies look like with Martin O’Malley as President? O’ Malley also recently announced an ambitious climate plan, that is being heralded as the most ambitious in The States if you don’t count California. Energy – Electricity consumption accounted for about 40% of Maryland’s gross greenhouse gas emissions in 2006. The programme EmPOWER Maryland, which was enacted in 2008, will reduce emissions from electricity consumption by 15% by 2015. The Regional Greenhouse Gas Initiative (RGGI) is a cooperative effort by nine Northeast and Mid-Atlantic states to design and implement a regional power plant emissions cap-and-trade programme. Revenues from the programme support energy efficiency programmes and augment EmPOWER Maryland and the Renewable Energy Portfolio Standard. Maryland’s renewable portfolio aims for the state to be provided with 18% of state produced renewable energy by 2020. Transportation – With the Maryland Clean Cars Programme it will adopt California’s stricter vehicle emissions standards and regulations. These standards became law in 2011 and have already led to reductions in emissions from cars. Land Use – Sensible and cautious approach to land development, making sure increased traffic and deforestation are taken into consideration favouring the least environmental impact. Agriculture and Forestry – even though these sectors contribute relatively low levels of greenhouse gas emissions, the sector also has a unique opportunity to remove carbon from the atmosphere. One programme will manage forests in order to capture carbon by promoting sustainable management practices in existing Maryland forests on public and private lands. Putting more forests into forest management regimes will increase the amount of carbon captured in forest biomass. Another programme will look at expanding forest covers, and the goal is to reforest 43,030 acres in Maryland by 2020. Needless to say this will add to even more carbon being captured by trees. Zero Waste – The State is currently developing a zero waste strategy to eliminate 85% of Maryland’s solid waste (residential and commercial garbage) by 2030.The waste would be reused, recycled, composted, or prevented through source reduction. Green Buildings – A strengthening of building codes which happens every three years that includes minimum efficiency standards will provide long-term emissions savings. Of course, it’s less than a year ago that Barack Obama was re-elected as President and it will be a while before we get confirmation on which candidates will challenge for the 2016 Democratic Presidential nomination. It’s important to bear in mind that this plan is a State plan, and will therefore be expected to be somehow different to the one Obama recently announced. But on the face of it, the greenhouse gas emissions reductions targeted by O’ Malley is far higher and more ambitious than Obama’s. Would he bring the same ambition to the table if he were to become president – only time will tell us.